An exploration of the relationship between humans and nature through conversations with 12 leading scientific and social visionaries. 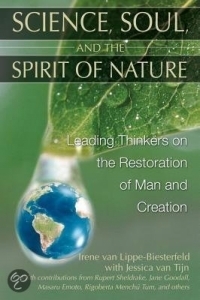 Explores the importance of the unification of humankind and nature as it relates to creation, destruction, diversity, and the spiritual health of the world. Contains interviews with Rupert Sheldrake, Jane Goodall, and Nobel Peace Prize-winner Rigoberta Menchú Tum, among others. Society’s attitude toward nature has changed considerably over the years. Terms pertaining to the anthropocentric paradigm of “mankind in charge”, such as supervisor or owner, have been replaced by caretaker or trustee. This approach, although more appropriate, still indicates a complete separation of humankind from nature. Yet increasing numbers of people have begun to feel that they are intrinsically part of nature. This concept of unity with the natural world – that we are nature – is gaining momentum among many innovative social reformers from many diverse fields. In Science, Soul, and the Spirit of Nature, Irene van Lippe-Biesterfeld interviews 12 respected visionary thinkers, representing all continents, about their deep connection with the earth and their views on the relationship between humanity and nature. Presented as a series of thought-provoking conversations, this book delves deeply into the many conceptions we hold about nature, showing that while many strides have been made in the area of its preservation, we must now take the next step. Each contributor adds insights into the urgent change in consciousness that we must adopt in order to heal and restore our holistic relationship with the earth that was emblematic of the first peoples–reminding us that a separation from and destruction of nature is a spiritual destruction of ourselves.